[Notice]: The original version of this press release is written in Japanese and written for the customers in Japan. Personal Media Corporation is happy to provide this press release in English for reference purpose. Tokyo, Japan -- A software manufacturer, Personal Media Corporation (hereafter PMC, President: Akira Matsui, Head office: Shinagawa-ku, Tokyo, Japan, Tel: +81-3-5759-8305, Capital: 10 million yen) announced today that PMC will start selling "Super Kanji Search -IVS Enhanced Version-" to corporate customers including local governments, public offices, governmental agencies and private companies on February 1st, 2013. 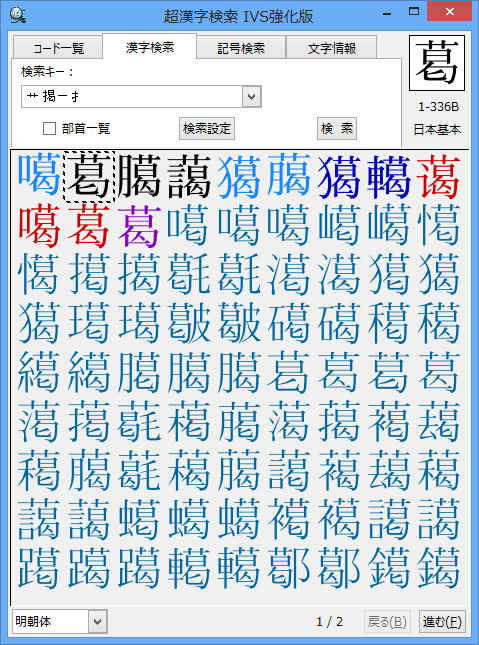 "Super Kanji Search" is a character search software with approximately 180,000 characters(*1). By using this software, you can search the desired character quickly. Recently, PMC has successfully developed "Super Kanji Search -IVS Enhanced Version-" by adding the functions for supporting Unicode IVS(*2) to "Super Kanji Search". PMC will be showing this software on the exhibition "TRONSHOW2013"(Venue: Tokyo Midtown, Date: December 12th to 14th, 2012). It would be great if you could stop by PMC booth(No.B-3). "Super Kanji Search" is the general character search tool for Windows, based on the technology of the TRON specification OS "Super Kanji". You can easily search(*4) 186,487 characters(*1) including kanji, characters and symbols by using the search keys. As the intuitive search keys, you can use not only reading and strokes but also component parts(*3) and/or variant characters. However, there have been restrictions on non-Unicode variant characters because Windows has a limitation of available character types. So, you cannot input non-Unicode variant characters to a Word document as a character(*5). Under these circumstances, IVS(*2) function was introduced to handle variant characters of kanji as coded characters in Unicode. Starting with Windows 8 went on sale on October 2012, the number of OS and application software which support IVS is increasing(*6). Besides, Information-technology Promotion Agency, Japan (IPA) started to release "IPAmj Mincho Font"(*7) for free since October, 2011. "IPAmj Mincho Font" includes a lot of variant characters supporting IVS. In this way, the environment on Windows for handling a lot of variant characters systematically without external characters or imaged characters has been prepared. The software PMC will start to sell, "Super Kanji Search -IVS Enhanced Version-" is the enhanced version of the general character search tool "Super Kanji Search" which is now being sold. 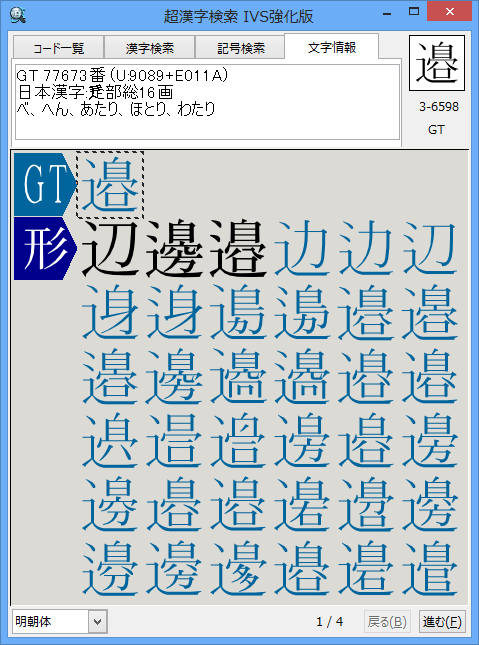 By using "Super Kanji Search -IVS Enhanced Version-", you can paste the searched variant character to the apps, because this software supports Ideographic Variation Sequence (IVS) of Unicode. If you have PC with "IPAmj Mincho Font", you can paste more than 50000 searched kanji and variant characters(*8) to Windows apps including Notepad, Word, Excel as a character. Thanks to "Super Kanji Search -IVS Enhanced Version-" and "IPAmj Mincho Font", you can efficiently search and input variant characters. Additionally, you don't have to make and manage external characters for handling variant characters for names. As a result, you can cut the cost of external characters. In addition to "Super Kanji Search -IVS Enhanced Version-", PMC will also provide the various solutions for variant characters, external characters and multi-kanji on your demand. For example, PMC can provide the customized "Super Kanji Search" supporting both your external characters and "IPAmj Mincho Font". PMC can also develop the external character conversion system which converts your existing data with external characters into the highly compatible data with Unicode IVS. The searchable characters by "Super Kanji Search" include about 50,000 characters in Daikanwa Dictionary, a lot of variant characters for names including Juki-kana, Hentaigana, Simplified Chinese, Traditional Chinese, Hangul, Symbols and Characters in Unicode. The total number is 186,487 characters (refer to Table1). But, the total number includes overlapping of the same character shapes in each character code. If the number of overlapped characters is removed from the above total number, the total number is approximately 100,000 characters (This number changes depending on the way of interpretation for overlapped characters). Unicode IVS(Ideographic Variation Sequence) is a specification for coding variant characters of kanji in Unicode. As the search keys for "Super Kanji Search", you can use radicals, component parts except radicals and their combination. So, if you are not familiar with kanji or radicals, you can easily search kanji characters. For example, when you look up the character "嶋" in a paper dictionary, you need to know the radical of "嶋" and select the right radical between "山" and "鳥". If you use "Super Kanji Search", you can use both "山" and "鳥" as the search keys. To improve the manipulation efficiency of "Super Kanji Search", PMC had carried out the experiment about entering characters on 12 examinees. In this experiment, PMC had observed and recorded the examinees' manipulations for searching unfamiliar characters. PMC had analyzed the manipulations and studied the highly-efficient way of searching characters. As one of the results, this experiment shows that the highly-efficient way is using parts of kanji and/or variant characters as the search keys, while the inefficient way is using strokes and strokes are used accessorily. These kind of results and know-how are reflected in "Super Kanji Search". You can input the searched character by Super Kanji Search to some Windows apps as an image(a graphic image representing the character). In this case, there is no limitation on available character types. However, there are several restrictions. The searched character's size and format cannot be matched with the settings of other normal characters. The image data cannot be entered to the database and cannot be used as the targeted information for searching. There are some apps which cannot support the image data, like Notepad. As an alternative way, you can make the external characters. But, the external characters cannot be used on the other PC environments and cloud. There is a limitation on the total number of available external characters. If you are the user of Windows 7, Microsoft Office 2007 or Office 2010, you can use the IVS function by downloading and installing the additional program for supporting IVS "Unicode IVS Add-in for Microsoft Office". "IPAmj Mincho Font" is a multi-kanji character font published as the result of "Research and development project of building the infrastructure for character information" commissioned by Ministry of Economy, Trade and Industry, Japan. "IPAmj Mincho Font" includes approximately 60,000 kanji characters such as 55,270 character of "Unified characters for census register" and 19,563 characters of "Unified characters for resident registry network system". By using "IPAmj Mincho Font", you can give the common codes to the variant characters for names/places, instead of the use of external characters. It is hoped that this font will improve the circulation and compatibility of text data including variant characters. It is also hoped that this font will cut the maintenance cost of making and managing external characters, because each local government makes and manages their own external characters. The total number of characters supported by Unicode IVS function is approximately 3,000 characters. These characters can be pasted to Windows apps as the character data. This total number is scheduled to be increased by the future maintenance of dataware. In addition, this software includes kanji characters which can be pasted as Extension A and Extension B of Unicode and kanji characters pasted as CJK kanji of Unicode 2.0(In the existing "Super Kanji Search", you can paste CJK kanji of Unicode 2.0, too). 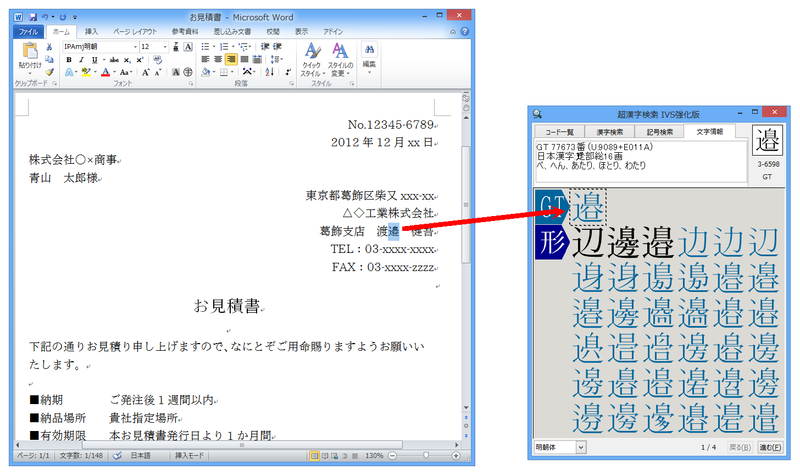 You can paste the searched multi-kanji and variant characters by Super Kanji Search as the character to documents of Windows apps including Notepad, Word and Excel. This software supports more than 50,000 kanji characters. PMC will increase the total number of kanji characters by the future maintenance of dataware. 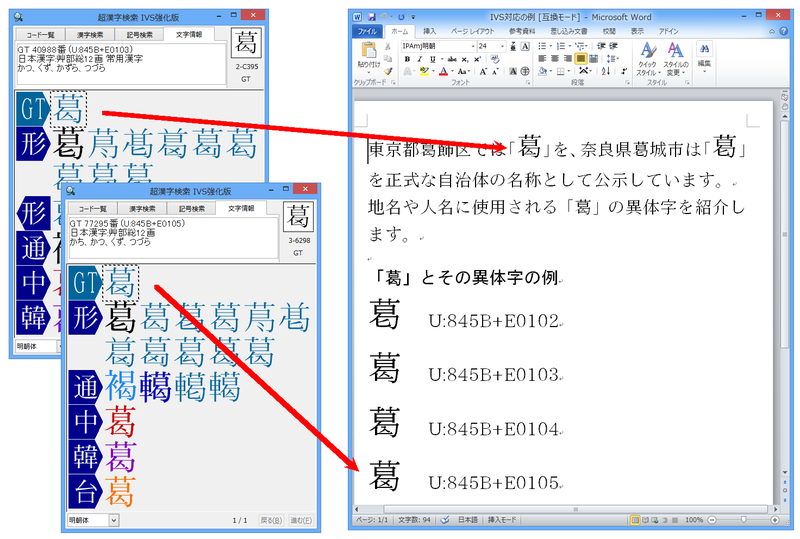 Multi-kanji and variant characters pasted in Windows documents are coded by the functions of Unicode IVS. These characters can be used mutually with no character corruption if the environment is changed, because they are not external characters. It is hoped that this software will improve the circulation and compatibility of the data including multi-kanji and variant characters. This software supports "IPAmj Mincho Font". This software runs on the environment such as Windows 8 with this font. In addition to kanji's reading and strokes, you can use parts of kanji(*3), variant characters and their combination as the search keys. You can search kanji characters by intuitively simple search keys. The simple way of searching characters in this software has adopted the character search functions of the existing "Super Kanji Search" and "Super Kanji" series sold for over 10 years. PMC receives many compliments on this way of searching kanji characters. PMC can develop and provide the customized version for corporate customers including local governments, public offices, governmental agencies and private companies which handle a lot of variant characters for names. For example, PMC can provide the tool for the input of multi-kanji and variant characters according to your character environment, by adding your external characters as the targeted information for searching. PMC can also port this software to the other OS like Linux. 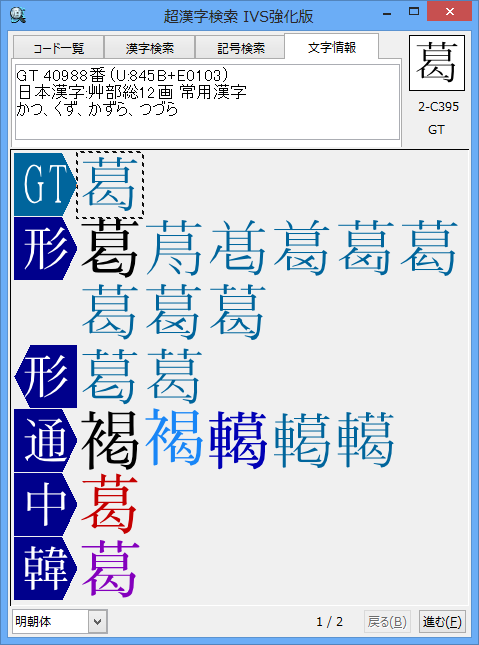 Kanji Search screen of "Super Kanji Search -IVS Enhanced Version-"
Variant character is pasted to Excel sheet. Character info and code of variant character in Word is displayed. Extended Chinese (Simplified Chinese, GB 18030) 634 Supporting a part of GB 18030. Daikanwa Dictionary 51,053 Daikanwa Dictionary (Author: Tetsuji Morohashi, Publisher: TAISHUKAN Publishing Co., Ltd.) Super Kanji Search includes all the characters which are posted as the original character in the second revision of Daikanwa Dictionary. ※ Regarding the number of characters which can be pasted to Windows apps as a character, please refer to (*8). "Super Kanji (Chojanji)"(http://www.chokanji.com/)is a BTRON specification OS for PC, developed as one of the results of TRON Project. "Super Kanji" can handle approximately 180,000 characters including lots of kanji characters. The first version of "Super Kanji" was released in 1999. Through the software upgrades such as "Super Kanji 2", "Super Kanji 3" and "Super Kanji 4", a lot of users have been appreciated PMC's software. The latest version "Super Kanji V" runs on a virtual machine of Windows. 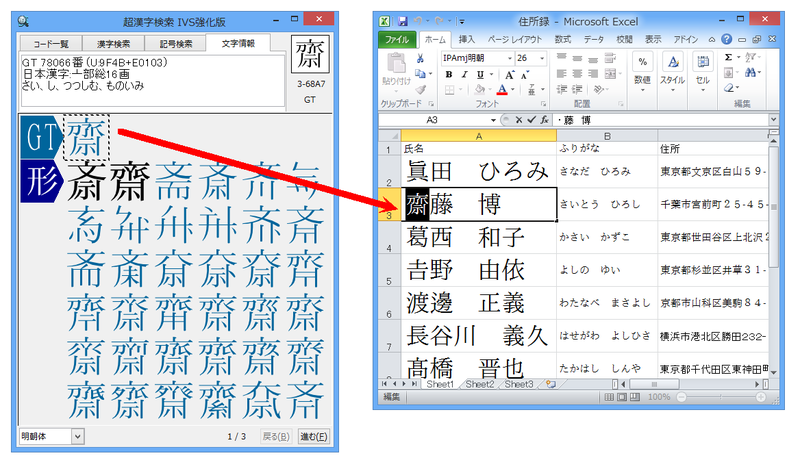 In addition to the existing multi-kanji function, the functions for the cooperation with Windows apps are added. The character search software for the other Operating Systems, "Super Kanji Search" was developed based on the technology and technical know-how of "Super Kanji"'s multi-kanji functions. Windows version, Linux version and Android version are available, depending on your environment. TRON is an abbreviation of "The Real-time Operating System Nucleus". 超漢字(Chokanji, Super Kanji) is a trademark of Personal Media Corporation. Windows, Word, Excel are either registered trademarks or trademarks of Microsoft Corporation in the United States and/or other countries. The other product names are trademarks or registered trademarks of their respective owners. The information in this document including the product specification and screenshots is as of the announcement date. Due to continued product upgrade or enhancement, the information in this document is subject to change without notice. Please check out the latest information when you purchase this software.